Voice-controlled digital assistants from Amazon, Apple, and Google currently have the upper hand in integrating home automation, but a new augmented reality app promises homeowners and renters visual control over their connected devices. 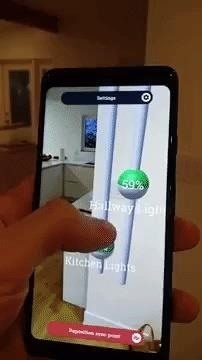 Smart AR Home, available on the App Store and Google Play, uses ARKit or ARCore to create a visual map of your home and allows you to interact with Samsung SmartThings and Philips Hue light switches and dimmers through the camera view of a smartphone. The app uses image recognition like a framed painting or a book cover to establish an anchor point in the house. From there, users can go to their connected devices and place virtual switches on top of their camera view. The anchor point synchronizes the device locations with the position of the smartphone. The user can also map the floor plan of his house via the horizontal and vertical surface recognition. The floor plan can be applied to a bird's eye view of the house from a 3D perspective, showing the locations of connected devices controlling the house from remote locations. While the selection of smarthome smartphones is currently low, the company notes that more platforms and device types will follow soon. At first glance, using a smartphone camera could make it difficult for someone to control a home when voice commands work just as well. However, the developer of the application, Binary Bananas, argues that the UI gives users better control over their smarthome devices. With the virtual switches of the app very specific settings can be made to set just the right level of illumination. I agree with the developer's thinking, because it's usually easier for me to swap volumes directly on Google Home's touch-sensitive interface instead of guessing what percentage of the volume I'm looking for. Ultimately, this app seems like a precursor to the much anticipated augmented reality wearables era, where, with digital overlays always present in the user's perspective, the visual control of the networked home could become second nature.